Mary Wollstonecraft Shelley (30 August 1797 – 1 February 1851) was an English novelist. She was born Mary Wollstonecraft Godwin, daughter of Mary Wollstonecraft and William Godwin, and married Percy Bysshe Shelley. My greatest pleasure was the enjoyment of a serene sky amidst these verdant woods: yet I loved all the changes of Nature; and rain, and storm, and the beautiful clouds of heaven brought their delights with them. When rocked by the waves of the lake my spirits rose in triumph as a horseman feels with pride the motions of his high fed steed. But my pleasures arose from the contemplation of nature alone, I had no companion: my warm affections finding no return from any other human heart were forced to run waste on inanimate objects. One thing I will add: if I have ever found kindness, it has not been from Liberals; to disengage myself from them was the first act of my freedom. I feel my heart glow with an enthusiasm which elevates me to heaven, for nothing contributes so much to tranquilize the mind as a steady purpose — a point on which the soul may fix its intellectual eye. So much has been done, exclaimed the soul of Frankenstein — more, far more, will I achieve; treading in the steps already marked, I will pioneer a new way, explore unknown powers, and unfold to the world the deepest mysteries of creation. All judges had rather that ten innocent should suffer than that one guilty should escape. What was I? Of my creation and creator I was absolutely ignorant, but I knew that I possessed no money, no friends, no kind of property. I was, besides, endued with a figure hideously deformed and loathsome; I was not even of the same nature as man. I was more agile than they and could subsist upon coarser diet; I bore the extremes of heat and cold with less injury to my frame; my stature far exceeded theirs. When I looked around I saw and heard of none like me. Was I, then, a monster, a blot upon the earth, from which all men fled and whom all men disowned? My food is not that of man; I do not destroy the lamb and the kid to glut my appetite; acorns and berries afford me sufficient nourishment. My companion will be of the same nature as myself and will be content with the same fare. We shall make our bed of dried leaves; the sun will shine on us as on man and will ripen our food. The picture I present to you is peaceful and human, and you must feel that you could deny it only in the wantonness of power and cruelty. I shall thus give a general answer to the question, so frequently asked me—"How I, then a young girl, came to think of, and to dilate upon, so very hideous an idea?" My dreams were all my own; I accounted for them to nobody; they were my refuge when annoyed — my dearest pleasure when free. Lord Byron, who was writing the third canto of Childe Harold, was the only one among us who put his thoughts upon paper. These, as he brought them successively to us, clothed in all the light and harmony of poetry, seemed to stamp as divine the glories of heaven and earth, whose influences we partook with him. I busied myself to think of a story, — a story to rival those which had excited us to this task. One which would speak to the mysterious fears of our nature, and awaken thrilling horror—one to make the reader dread to look round, to curdle the blood, and quicken the beatings of the heart. If I did not accomplish these things, my ghost story would be unworthy of its name. I saw the hideous phantasm of a man stretched out, and then, on the working of some powerful engine, show signs of life, and stir with an uneasy, half vital motion. Frightful must it be; for supremely frightful would be the effect of any human endeavour to mock the stupendous mechanism of the Creator of the world. The idea so possessed my mind, that a thrill of fear ran through me, and I wished to exchange the ghastly image of my fancy for the realities around. I see them still; the very room, the dark parquet, the closed shutters, with the moonlight struggling through, and the sense I had that the glassy lake and white high Alps were beyond. I have chosen my boat, and laid in my scant stores. I have selected a few books; the principal are Homer and Shakespeare — But the libraries of the world are thrown open to me — and in any port I can renew my stock. I form no expectation of alteration for the better; but the monotonous present is intolerable to me. Neither hope nor joy are my pilots — restless despair and fierce desire of change lead me on. I long to grapple with danger, to be excited by fear, to have some task, however slight or voluntary, for each day's fulfilment. I shall witness all the variety of appearance, that the elements can assume — I shall read fair augury in the rainbow — menace in the cloud — some lesson or record dear to my heart in everything. Thus around the shores of deserted earth, while the sun is high, and the moon waxes or wanes, angels, the spirits of the dead, and the ever-open eye of the Supreme, will behold the tiny bark, freighted with Verney — the LAST MAN. A truce to philosophy! — Life is before me and I rush into possession. Hope, glory, love, and blameless ambition are my guides, and my soul knows no dread. 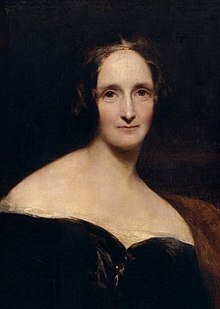 It was a fight for Mary Shelley, too, of course, the woman who created the genre and whose book was published without her name on it with an introduction written for her by her husband. But remember this: Mary Shelley was originally tasked to write a ghost story. Instead she invented science fiction with a novel that spoke of horrors yet pierced the heart of humanity. Women, eh? Never doing what they’re told, breaking all the rules, and creating things of a rare and lasting power. This page was last edited on 23 September 2018, at 13:01.